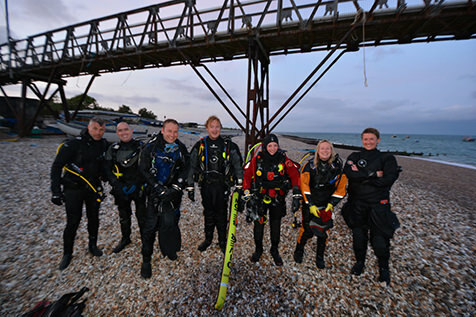 Learn to scuba dive in West Sussexs premier 5star IDC Dive Centre! Here at Ocean View we train divers using the PADI system, with modern instructional methods and materials, students learn quickly and effectively at their own pace. Your PADI qualification will be recognised worldwide. With our highly qualified, friendly Instructors you are taught all the essential skills to get the most enjoyment out of your diving adventures and from our scuba diving courses. We keep classes small to ensure optimum learning, individual attention and most importantly, maximum safety. Your first impressions and memories of the underwater world will be lasting ones…we want them to be fantastic! To get you started you are welcome to come and do a Discover Scuba Diving session in our warm private pool in Lancing, before embarking on the adventure which is the Open Water Diver Course. Beyond Open Water Diver we can take you to new levels of adventure with the Advanced Open Water Diver course and Specialities such as Deep Diver, Wreck Diver or Underwater Photographer. We can help you learn to have the skills to help others through becoming a Rescue Diver. Ultimately you can also decide to Go Pro, by becoming a PADI Divemaster and Instructor, learning to teach others the skills and techniques they need to safely enjoy the underwater world. Ocean View also uses the PADI TecRec training system, for those that wish to have adventures beyond the recreational limits. Our onsite pool is a fantastic feature that we have here. It is kept to a toasty 32 degrees all year round. With a shallow end of 1.2 metres and a deep end of 4 metres, it is a perfect Scuba Diving pool. We offer first-class servicing, maintenance, repair and impartial advice on all scuba diving equipment and peripherals. All servicing is carried out on-site in our service centre in Lancing, where every stage of servicing is carried out by experienced, qualified technicians with craftsmanship and quality guaranteed 100%. With our spotless Bauer Compressor we offer the following services: Nitrox clean air to 300bar, Nitrox fills to 100% Oxygen and Trimix fills, we always carry Helium but ask that you give us a quick call with requirements. We service all major brands of equipment. Onsite servicing is carried out for regulators, BCD’s, drysuit repairs, cylinders and various other small items. If you have a cylinder in for test with us, we will always let you use one of ours at no cost if you require it. If an item needs to be sent off to a manufacturer, we will always inform you before hand. All of our school equipment is available to hire. Whether you need just a regulator or a full UK equipment hire package, we can ensure that you get fitted out for the right kit for the job. The Ocean View Diving Club is an extremely active club, meeting every Wednesday evening throughout the year from. On a Wednesday evening you have the choice to either come up to the bar and socialise, maybe to chat about your last dive or even plan you next dive. You can go into the pool with either our school equipment or maybe to test out a new piece of your equipment, maybe you are going to go over some skills that you have previously been taught. Obviously, if you want to, you can do both! We arrange regular local dives as well as UK diving trips and diving holidays abroad. Outside of the diving scene we also arrange social events like meals out, dog racing, ten-pin bowling and quiz nights. So whether you are a seasoned UK diver or a warm water diver, we believe that Ocean View have something for everyone. Even if you are a diver and your partner is not, you can be sure that everyone will always be made welcome to the "Best Dive Club" in the land!